The event will be held Sunday, February 12 from 2-4 p.m. 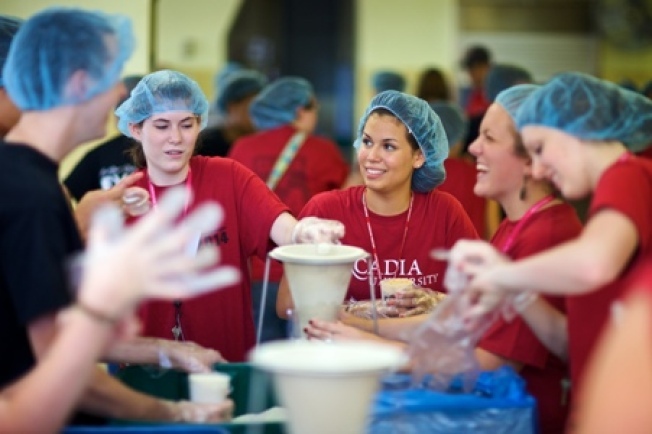 The Community Service organization at Arcadia University is fighting hunger this Sunday, Feb. 12, by hosting their second Pack-a-Thon for Stop Hunger Now on their Glenside campus. Students, alumni, and community members ages six and up are invited to partake between 2p.m.-4p.m. in this fund raising event. Similar to a Walk-A-Thon, participants must raise at least $10 in advance. Those involved with the Pack-A-Thon will organize an assembly wide proces to package dry rice and soy ingredients for nutritious meals. These kinds of foods are also used in crisis situations and school feeding progams found nationally and internationally. Helping volunteers pack will be Miss Philadelphia, Maria Sciorillo, reports Arcadia Community Service Office. When attendants are not partcipating in the packing process, the Philadelphia Union's Mobile Tour will provide guests with exciting activities to keep the energy levels high. The Union Soccer team will also allow volunteers to use their inflatable and interactive unit, according to Arcadia Community Service Office. The Pack-A-Thon will be held in Arcadia's sports dome. The committee hopes the event will bring out 800 people, which is the maximum number of occupants. Their ultimate goal is to create 80,000 meals through fund raising efforts, so that each meal will cost 25 cents. Every meal made at the Pack-A-Thon will be distributed internationally and can be tracked on the internet. Nutrisystem will be an active part in the fund raiser. Arcadia plans to give volunteers a fun and exciting environment to work in during the Pack-A-Thon. People are encouraged to make the most of this upcoming Sunday, and join Arcadia in their battle against hunger. Arcadia University is located at 450 South Easton Road in Glenside. Late participants can register Sunday at the sports dome between 1p.m. to 1:45 p.m.
For more infomation visit Arcadia's website.